'The shots directly influenced by Lang's film are regularly impressive: Tima's creation smartly parallels that of the Maschinenmensch, whilst the colossal ziggurat at the centre of Metropolis provides some of the film's most striking images'. Ostensibly an adaptation of Osamu Tezuka's 1949 manga of the same name, which in itself took inspiration from Fritz Lang's hugely influential 1927 silent film (although Tezuka had only seen one image from Lang's film when creating his comic), it's perhaps not surprising that Metropolis continually feels caught between the different influences upon it. Together, director Rintaro and screenwriter Katsuhiro Otomo blend loose influences from previous works with ideas of their own and from elsewhere in the sci-fi genre. The plot of Metropolis is therefore an amalgamation of several narrative influences, a decision that creates problems which Rintaro's film never manages to satisfyingly overcome. The sociopolitical elements which come largely from Lang's film never sits entirely comfortably alongside the relationship between teenager Kenichi (Kei Kobayashi) and advanced robot Tima (Yuka Imoto) which, apart from existing between a human and a machine, is largely conventional in its execution. Whilst Lang occasionally made his film too thematically dense for its own good, the problem is greater here, Rintaro straining at several points under the weight of the commentary he takes on. A subplot involving workers waging an insurgency against the employment of robots in Metropolis struggles to get enough screen time during the first half, only to then be concluded a bit too hastily when the focus shifts further onto Kenichi and Tima's story later on. Aesthetically, Metropolis owes just as much to Blade Runner as it does to its overt sources, the director achieving a satisfying postmodern style that blends futuristic sci-fi with hardboiled crime fiction. The occasional use of computer animation sits well alongside the traditional hand drawn artwork for the most part; the inclusion of a giant robotic CGI fish in the background of one early scene is distracting, but is thankfully uncharacteristic of the director's approach overall. The shots directly influenced by Lang's film are regularly impressive: Tima's creation smartly parallels that of the Maschinenmensch, whilst the colossal ziggurat at the centre of Metropolis provides some of the film's most striking images. Look past its impressive visuals and lofty cinematic influences, however, and there's simply not enough narrative and thematic craft within Rintaro's film to recommend it as highly as other Japanese animated features of the same period. 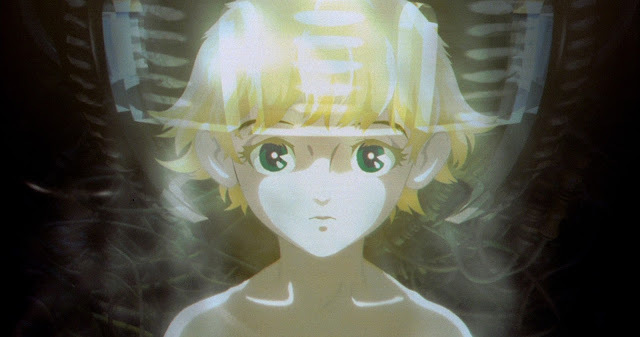 Metropolis was released in the same year as Studio Ghibli's Spirited Away, and Rintaro's film is consistently outstripped in terms of character and storytelling when placed side by side with that of Hayao Miyazaki. Metropolis was released as a limited edition Dual Format Blu-ray & DVD steelbook on Monday 16th January 2017. A special edition Dual Format Blu-ray & DVD will be released on Monday 13th March 2017.